I am off from work this week--decided I needed a break and change of scenery from the daily grind. 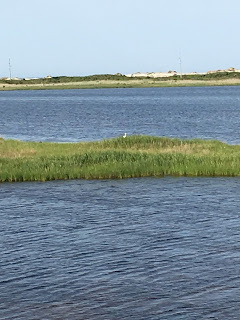 It is a glorious time of year, we are just starting to see tiny changes in the weather, lower temps, and an occasional colored leaf, although most everything is still pretty green. It feels good to be a homemaker as my full-time and only job for a few days. I accomplished some much needed fall cleaning early in the week. As part of this, we are updating a few pieces of furniture in the family room, and we moved the piano out of that room to the living room. Some call it a formal living room, but there is nothing formal about me or my home. 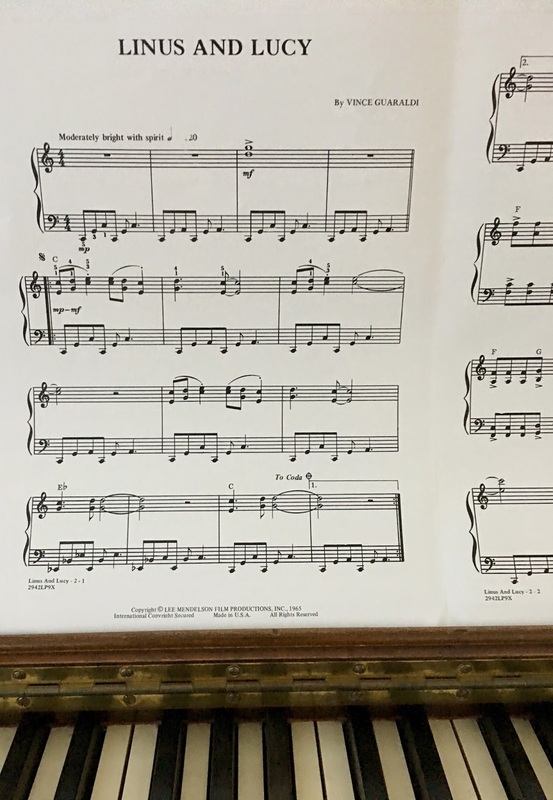 The room is not used as much as others, but it is a lovely quiet spot to take a phone call, read, and now practice playing the piano. My mom, on the other hand, could play the heck out of that piano, every kind of music except classical. She played hymns, contemporary church music, Christmas carols, honky-tonk, polkas, and any pop song from the radio. I have all of her sheet music, the piano bench is full, and I have another huge box of it in the attic. Lots of 70's fun. She could listen to a song on the radio and then sit down and play it. 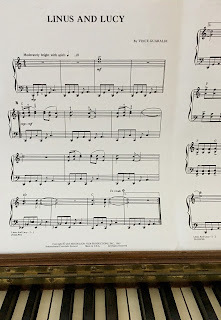 She had such a God-given gift, which she used frequently in our hometown Presbyterian Church to accompany soloists and perform with the choir for holidays. I cherish these memories. 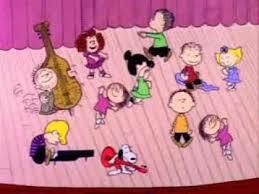 My goal is to learn the Charlie Brown song, to be able to play it gleefully well. Above the piano are old photos from my parents' wedding in 1947. 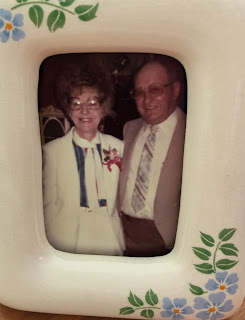 Dorothy and Fred (affectionately known as Dot & Fritz) were engaged before my dad shipped off to the Philippines in WWII and were married as soon as he returned from his two years of service in the Army. 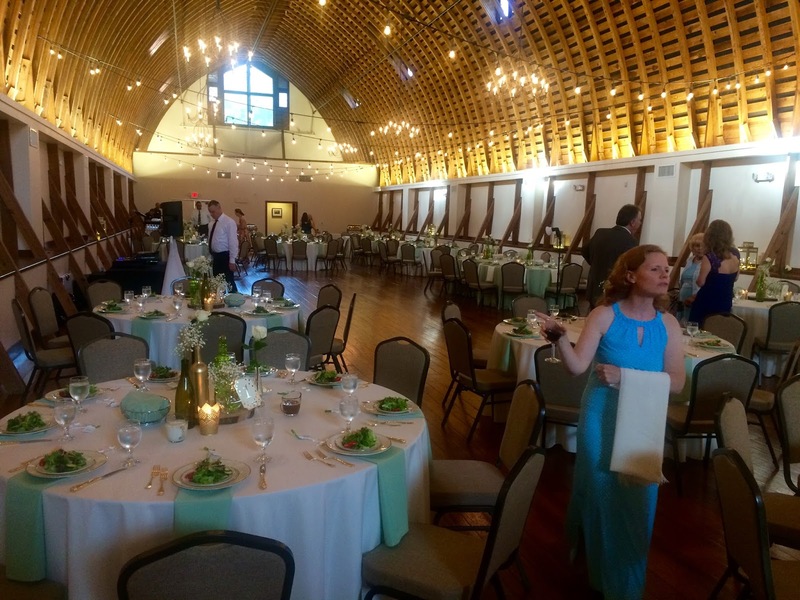 They had a huge two-day Dutch Hop wedding, the kind that was popular in German farming communities like Goshen County, especially in the 40's and 50's. The Dutch Hop is a type of dance and style of music particular to the Germans who immigrated to the U.S. in the late 19th and early 20th centuries from Russia's Volga River region. It's similar to a polka, but has more of a hop to it. A polka band with a dulcimer played at the wedding. If you wanted to have a dance with the bride, you had to pin money on her wedding dress. 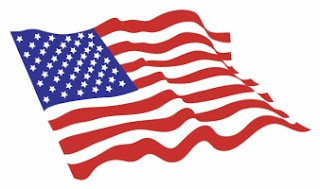 The German farm wives prepared all of the food, noodle soup and butterballs, light rye bread, garlic sausage, and vegetable beef soup, salads and dessert, and kegs of beer and bottles of whiskey. The cooks brought favorite glasses, plates, or bowls and smashed them on the floor as they danced around the couple. I really hit the jackpot when it came to parents. We were honored this weekend to gather with our family friends, David & Susan, and their extended family to celebrate the wedding of their youngest daughter Liv (whose sister Alexa was the bride in 2015). 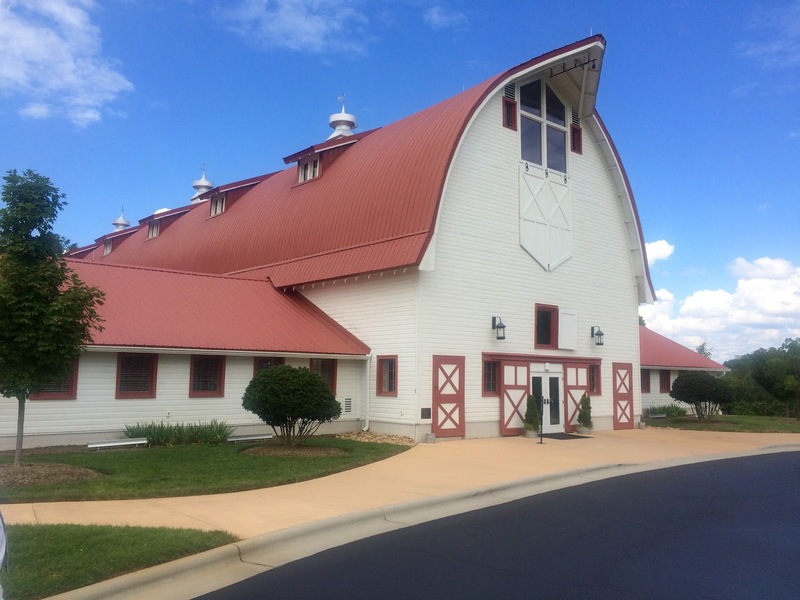 Years ago during our soccer travels when our daughter played, I remember passing a beautiful old abandoned dairy barn as we drove around a sharp curve to the complex. I remember saying how I wish someone would turn it into a restaurant or event place. When we got to the wedding destination just outside of Winston-Salem, NC, I was shocked to discover that Liv's beautiful wedding was going to be held inside that renovated barn. It is now called the WinMock at Kinderton. Check out its story, what an incredible venue. Congratulations to Johnny & Liv, enjoy the high seas, and we look forward to seeing you at the Fantasy Football Live Draft later next week! 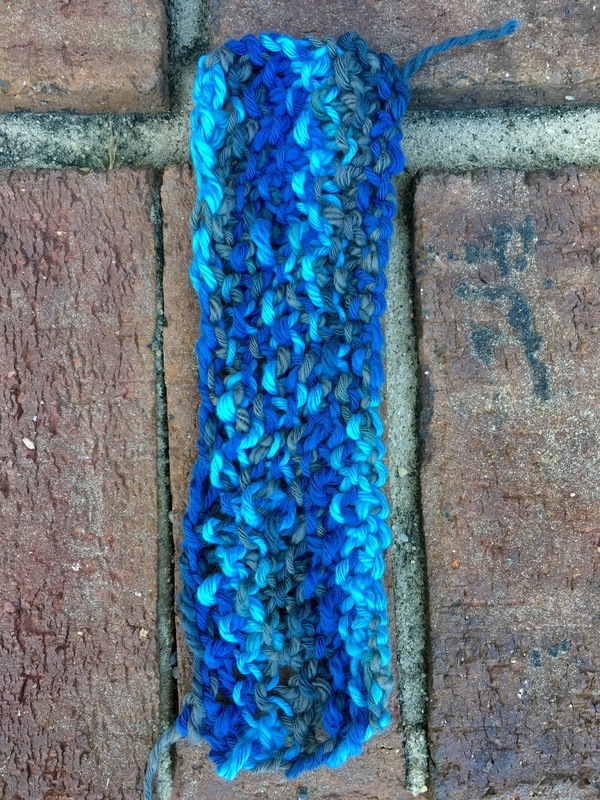 I have a finished object to share, it's the Montego Bay Scarf, and I'm happy with how it turned out. It was fun adding the fringe to the ends. For my birthday earlier this month, Susan gave me a generous gift card to my LYS. I couldn't wait to pick out some yarn. 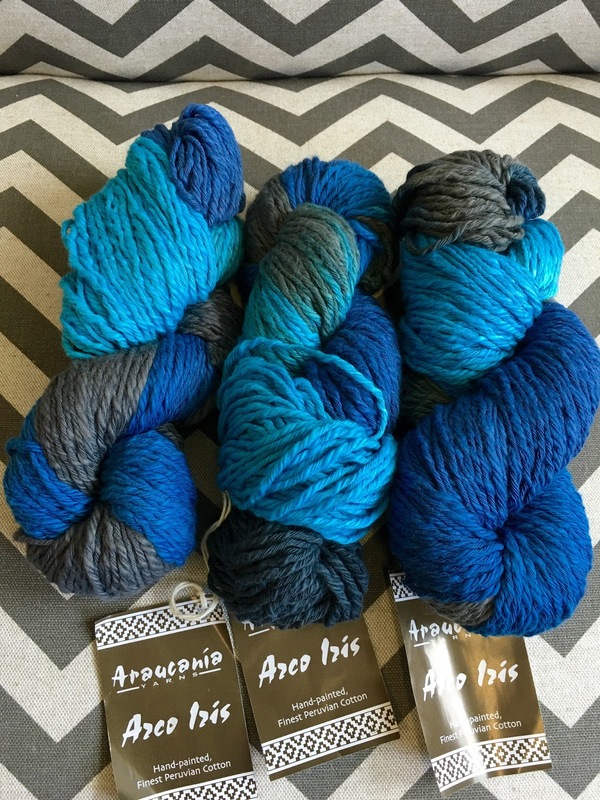 Normally when I buy yarn, I have the pattern picked out. This time, I went into the store expecting to come out with something with linen content. I didn't care for the colors that were on the shelf, and the helpful store clerk steered me toward some 100% bulky cotton in Carolina Panthers colors. I finally chose the pattern called Knotted Openwork Cowl that is simple and shows off the variegated colors of the yarn. It's really turning out well, and I would like to make the pattern again with a handpainted wool. I'm a bit sad to see the Olympics come to an end, but our household is definitely ready for some football! The Carolina Panthers report to training camp at Wofford College today. We were watching a pre-camp program on one of the local channels featuring a former player who had been through this experience. He gave the advice to those attending to embrace the grind. I feel sorry for the poor (I mean rich) players and even more sorry for all other individuals who have to make a living out in this heat we're having. So Steve and I are adopting this motto as we slog through the second half of this brutally HOT summer. ETG . . . we are embracing the grind! The grind of the early morning alarm clock, the drive to and from work, and the sprint in and out of air conditioning. 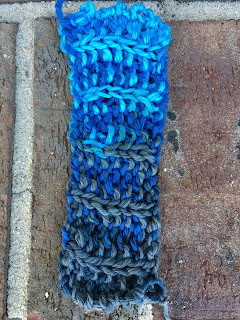 In the meantime, there is glorious summer knitting. I took advantage of Churchmouse Yarns featured faves 20% off and ordered enough skeins of Berroco Indigo to make the small block stitch baby blanket in the off-white color "cut-offs". The pattern and yarn call for a size 7 needle. 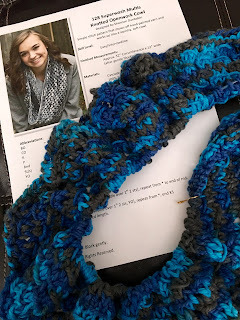 Normally for a blanket pattern, I would just jump right in, but this time I decided to swatch to determine not only gauge, but what type of needle I wanted to use with this 95% cotton yarn. With my loooooooose gauge, especially with cotton, I had to go down to a size 5. I'm using Knitter's Pride Karbonz carbon fiber 32" circulars, which are absolutely perfect for this fiber. It's very exciting to get started. 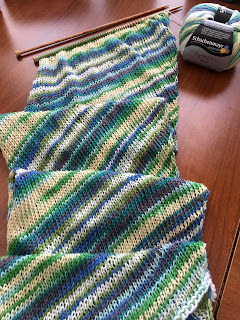 I'm in no hurry to complete, this will be a knit-when-I-feel-like-it type of project. 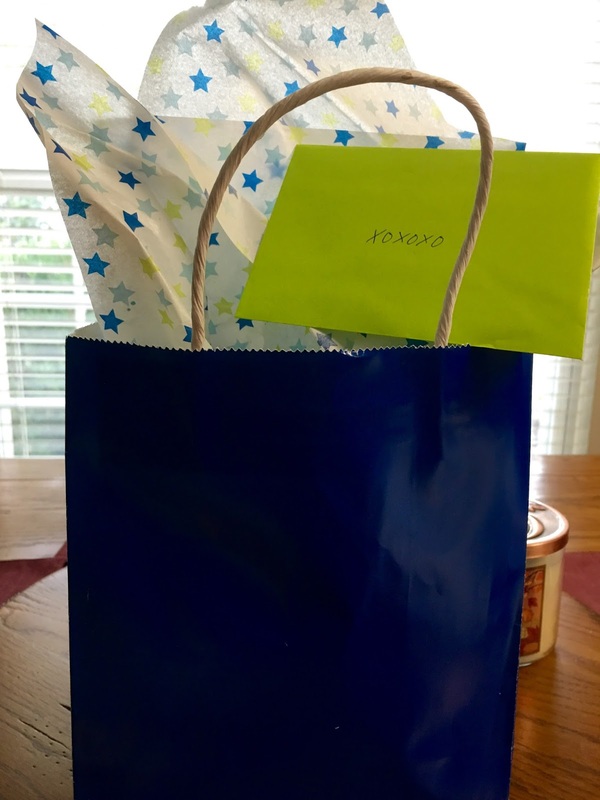 It won't be a bad idea, though, to have a cute little neutral baby blanket on hand when a special gift is needed. A bulky/cushy cold-weather blankie sounds most ideal, but it really isn't ideal for a baby born in the South. We just don't have enough cold days for a heavy blanket to be used. This light cotton that is washer/dryer friendly is so much better suited. The color looks a little drab in the photo, but in real I think it is gorgeous. 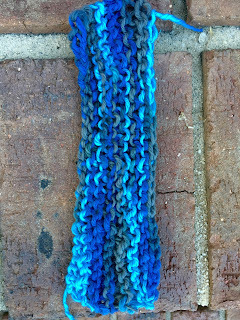 Kay at MDK is making a summer scarf out of this yarn. While reading through the comments in her post about it, I saw someone had shared the news that "tink" is now a new word in the Oxford Dictionary. More here. I truly love all four seasons, and it is wonderful to live in a state where we get to experience each one equally. Summer has so much going for it, especially when being on and in the water is involved, and the delicious produce and recipes that only appeal in hot temps. However! This extreme stuff is overwhelming, and it's time for football! Today, I wish I were in Wayne, Nebraska. It is Chicken Show weekend, small town living at its very finest. 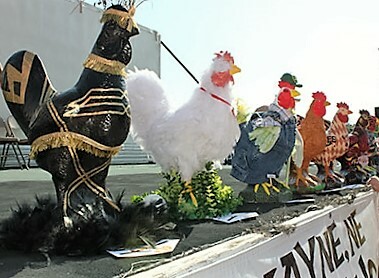 Ravelry friend Sharon is no doubt right in the middle of the hens! It's a slow and hot Saturday here in North Carolina. 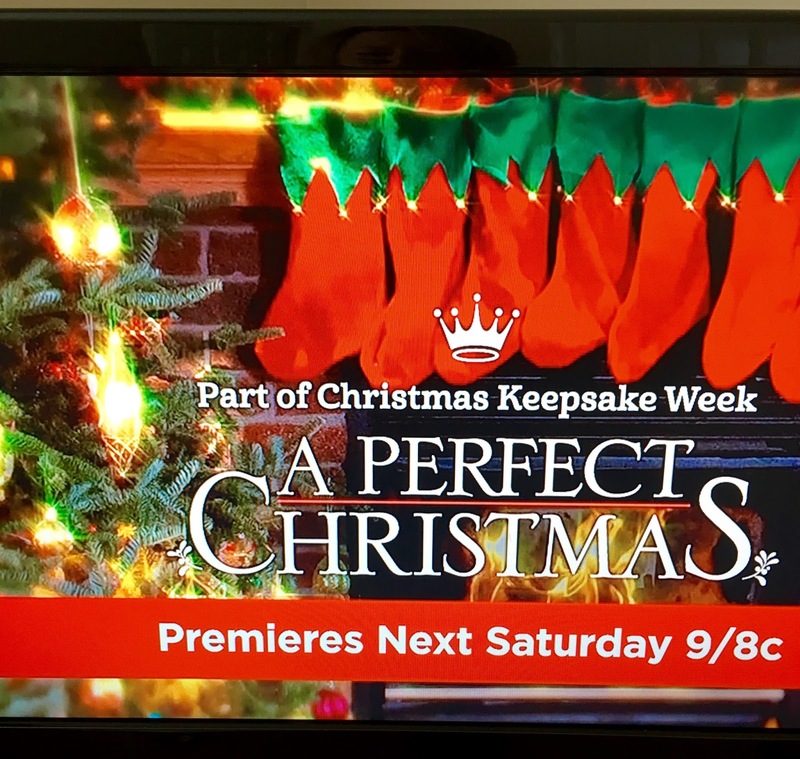 So slow that I'm watching back-to-back Hallmark Channel Christmas movies. The perfect dose of fictional escapism. 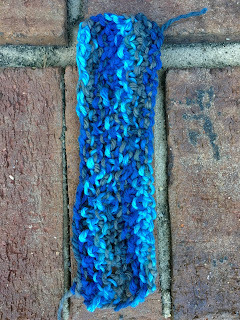 Summer is at the half-way mark, and I would say I'm at midpoint with my summer knitting projects. 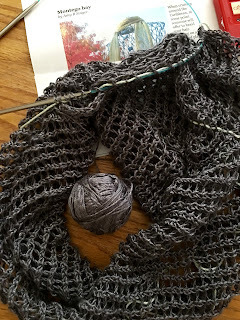 The Montego Bay Scarf in that precious skein of Handmaiden Sea Silk (Charcoal). I've been dedicated with adding a lifeline string every four or five inches of progress. 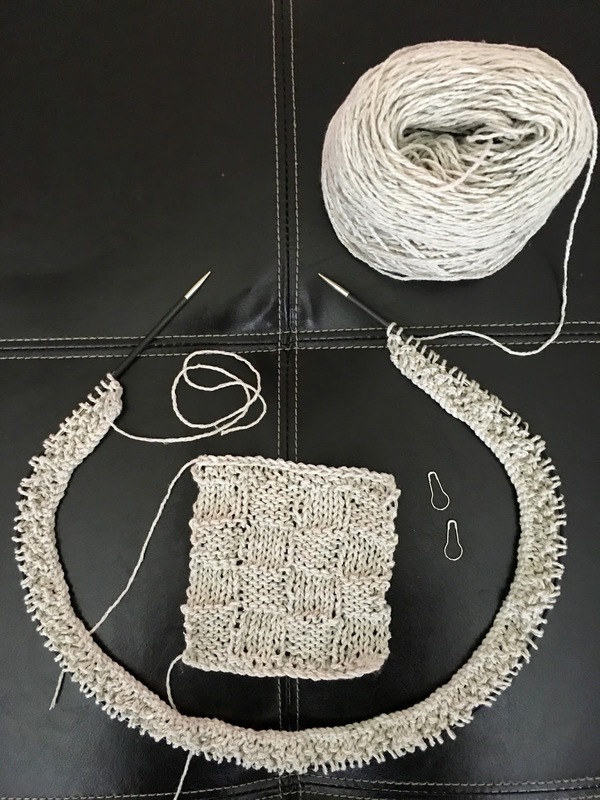 I'm half-way through with the Tahiti Bias Before and After Scarf (Breeze). One ball complete, one to go. Also, a second pair of School Girl Socks in Quince & Co. Chickadee (Egret). The pair I made in Leek turned out okay except the cuff was too tightly cast on and very hard to get on over my heel. 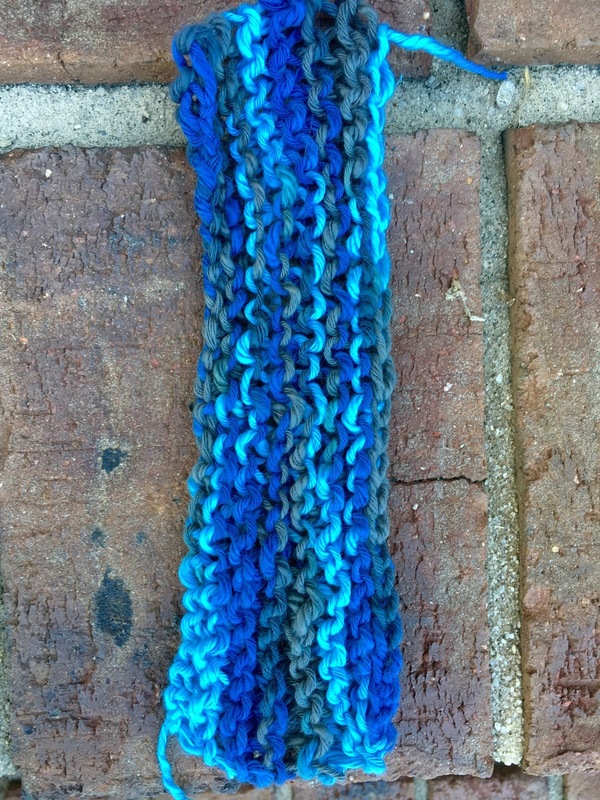 For this newest pair, I learned how to do the German Twisted Cast-on from Staci at VeryPink. Her how-to videos are my favorite. 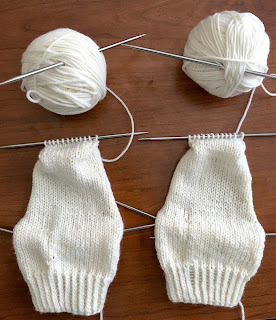 I knit sock one and sock two parallel: cuff-cuff, heel flap-heel flap, turn heel-turn heel, etc. 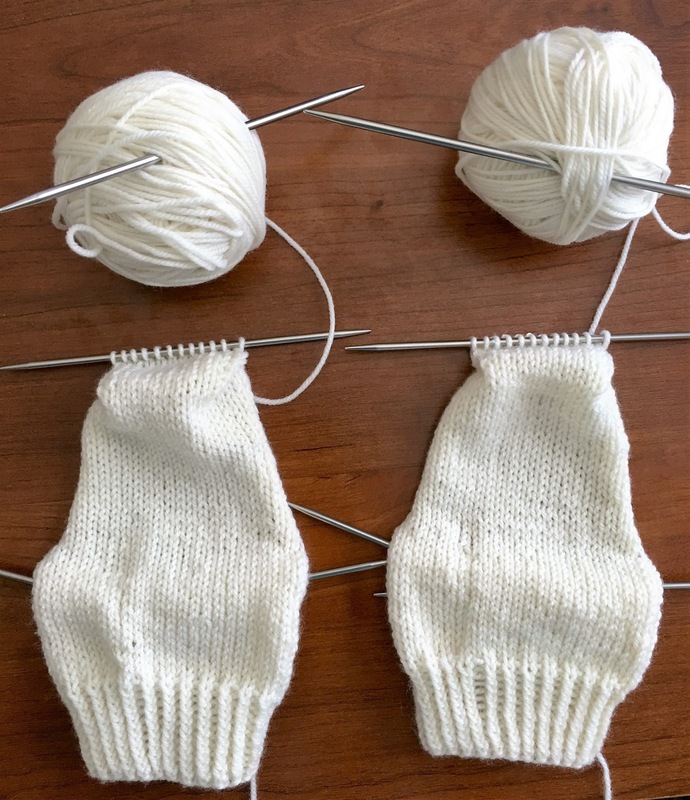 If I knit one complete sock, I can guarantee that second one won't get picked up until a year later. So by the time I get these summer projects completed, it will be fall. They may not get worn until next summer. 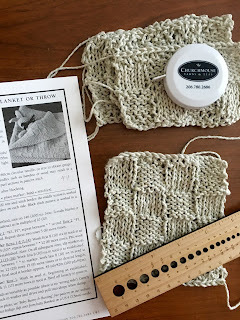 There's no way I could knit with bulky wool in the summer, and it wouldn't be much fun to use summery cotton yarn for my winter knitting. Our new address is: 00000 Beachfront Private Drive, The.Island #nozip. Off the grid and not visible on Google maps. It has everything we need -- front porch facing the beach, back deck facing the beach, hammocks, space for a lazy ole dog that we have yet to adopt, and plenty of room for you to come and visit. We plan to spend our remaining years off-line, enjoying a barefoot, stress-free existence, cheerfully oblivious to any signs of politics, negative news, the stock market, and the Kardashians! We may take up a new hobby . . .
and will respectfully observe all of God's beautiful creatures . . .
Oh, just kidding! 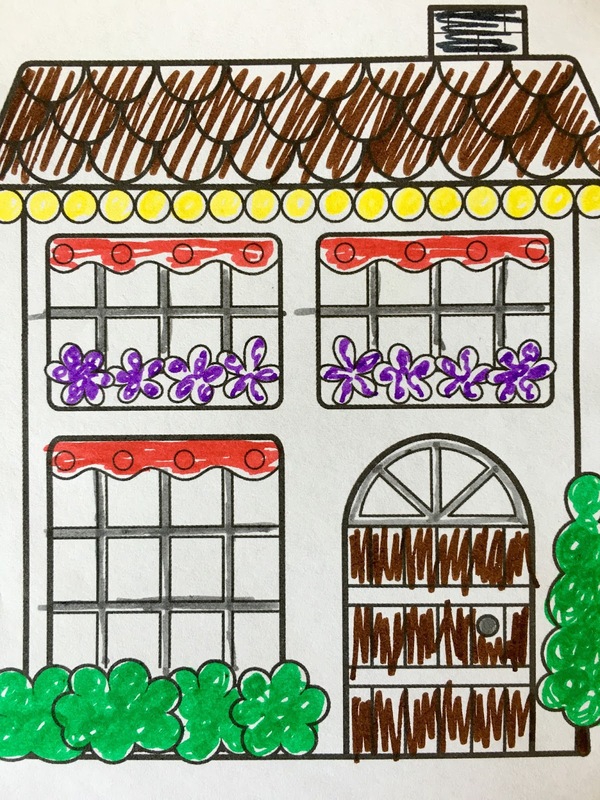 You know how I love my home and everything in it, and we could never move away from ♪ the house that built you ♫. We are simply not over that fabulous VACAY yet from May. It has been a long week at the office. It's so wonderful to see your smiling faces as often as we can, and I wouldn't trade that for all the sand in the Outer Banks. Is this a true or false statement . 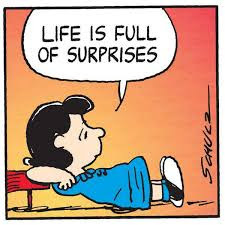 . .
Well, life used to be full of surprises a generation or two ago. It seems like there is not much anticipation time these days for life's events and daily business. Dating: Before eHarmony, Match, Facebook, and LinkedIn, there were for-real blind dates. You did not see or learn about the person until you met face-to-face or had a phone conversation. Information was based on word-of-mouth from the person who set you up. Major anticipation. Newlyweds: Living with a new spouse for the very first time after the wedding--lots of surprises. Not too common any more. Babies: That anticipated moment when the doctor catches the newborn and exclaims, "It's a BOY" or "It's a GIRL"! Family members were then notified of the gender and name after the birth. Only a mother's intuition revealed anything beforehand. Teenagers: Parents waited up, because between the time kids left the house until curfew time, they were not reachable by text or phone. I drove a group of girlfriends to an out-of-town basketball game about an hour away senior year of high school. Coming home we chose the wrong direction, headed south instead of north, sort of making a complete circle to return. Our parents had no way to contact us to find out why we were not pulling into the driveway at the anticipated time, rather than waaaay late, like 2 a.m.
College Acceptance: Running to the mailbox awaiting that thick oversized envelope from the university of choice. Now the news is shared with a simple login. There is still anticipation, but goodness the results come so much faster. Who's calling: There was a house phone for the whole family. No caller-ID, no VM or answering machine, no call waiting. The identity of the caller was a surprise every time the phone rang. Mailbox: It was nice to anticipate the daily postal mail with correspondence from friends and loved ones on a regular basis. I have kept every letter my mom wrote to me the first year I moved away from home. I'll always cherish those. I was so homesick. Tractor technology: My dad drove mostly old John Deere tractors on the farm, and it was such a big deal when he got his first cab tractor with air conditioning. How cool that farmers now have cell phones, GPS, and info screens. 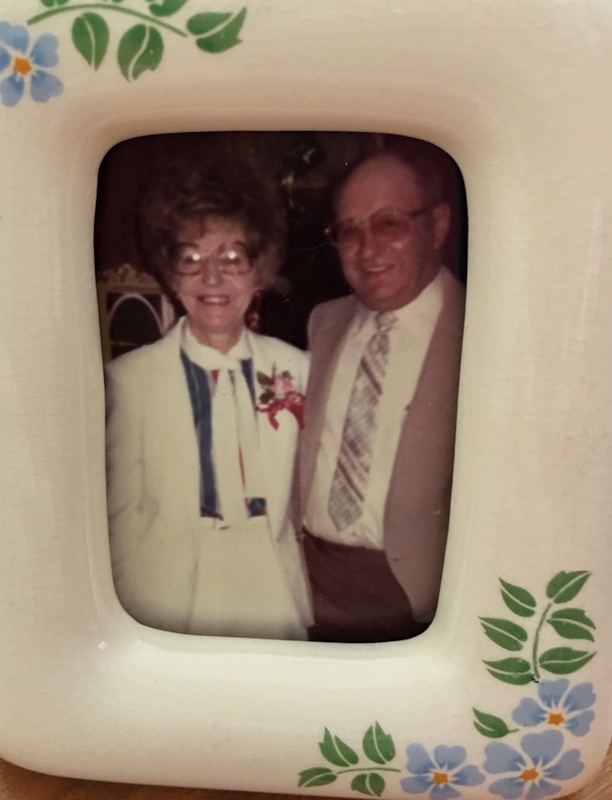 Many times, I remember my mom had to drive out to the fields to find Dad because there was no way to reach him if he was late for dinner, and she would try to hide her panic, worrying that he had been in a farm accident. 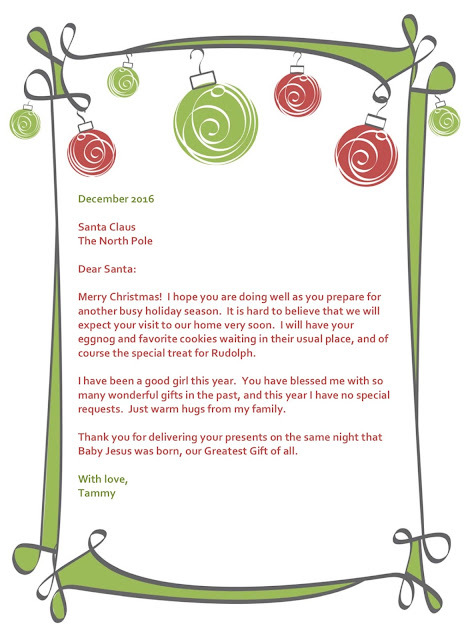 Annual Christmas letter: A year's worth of news was saved up to share with distant relatives and old friends. Now all of that plus a lot more is OVERshared on a regular basis with social media. What is my credit card balance? I check my account online every morning. Remember waiting for the monthly statement to come in the mail? I need to deposit my (paper) paycheck. I've had direct deposit for over 30 years, but I do remember back when my paycheck was handed to me, and I then had to walk/drive rush to the bank to deposit it. Did the check clear? Online banking has eliminated the need for a checkbook and checkbook registry. Our accounts are always up-to-date with the rare surprise. Beeping appliances: All of our household appliances chime/beep/chirp when their cycle is complete. Very annoying sometimes, but we know when the dryer has finished tumbling and the coffee is brewed! I hope there's ice: Our fridge makes ice as fast as I can use it. Remember filling ice cube trays? Most of the time they were empty when really needed. Photos: Oh the anticipation of waiting on a 24 roll of Kodak film to be developed, usually by mail-order. It would be several weeks before the photos were returned, and in my case it would net about three great, unblurry photos. "I'll share my vacation photos with you once I get them organized into a scrapbook," we used to say. Now it's one, two, three, FACEBOOK! Time and temperature: There was a phone number we dialed (from the house phone), sponsored by a bank, that would announce the correct time and current temperature. That info was not readily available at our fingertips. The other way to get the current temperature was to drive by the big bank on the corner of Main Street and look up at its scrolling electronic message display. 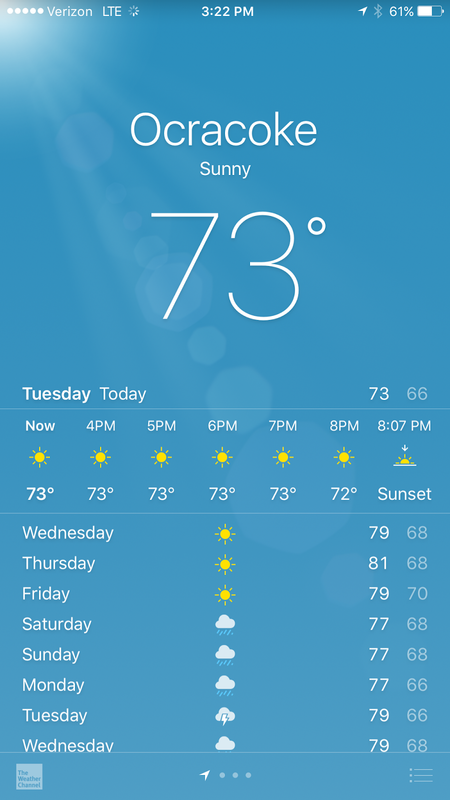 Weather forecast: Available through the Farmers' Almanac or local weatherman. 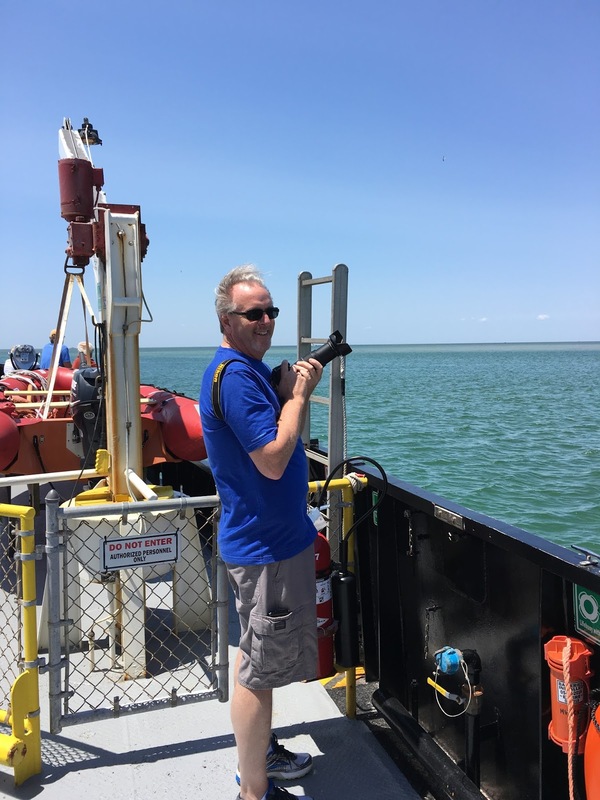 We did not have access to snazzy Doppler Radar apps predicting when the rain would fall. Am I lost? It's still possible to be lost, but with GPS guidance, the correct route is quickly available. Remember the printed AAA TripTiks? Where were you when you heard the news? Now almost all of us are learning about breaking news stories at the same moment--when the notifications start coming through our phones. Bon Voyage: Did the flight arrive on time? No news is good news. But now we can FlightAware-it from takeoff to landing. I'm dying to read that new bestseller: My name would have been on the local library's wait-list for a month or three; now in 30 seconds or less, I can download it to my tablet. Test results: professional exams, lab results from the doctor . . . very little wait time to know if you passed. 2-day delivery: Instead of waiting for a slow catalog mail-order delivery, Amazon Prime seems even not immediate enough. Facts: I'll need to research that topic with the encyclopedia, but we don't have a set at home. Or, I can ask Siri. Need a quick medical diagnosis? WebMD is too convenient (my symptoms always show that I'm either pregnant or gravely ill). And finally, Knitting: If I didn't have access to YouTube videos and knitter forums, I would have given up on this damn hobby a long time ago! Now, I'm not THAT old! This shows how things have changed in our lives so much in a relatively short amount of time, almost all for the better. My parents have both been gone for a long time, and I often think about how amazed they would be to see how the world runs today. Can you think of other surprises we no longer have to wait for? 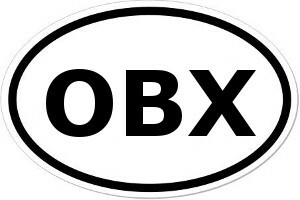 When we moved to North Carolina from Tennessee 18 years ago, I would frequently see this bumper sticker and not know what it meant. I looked it up a few times, but then would forget. 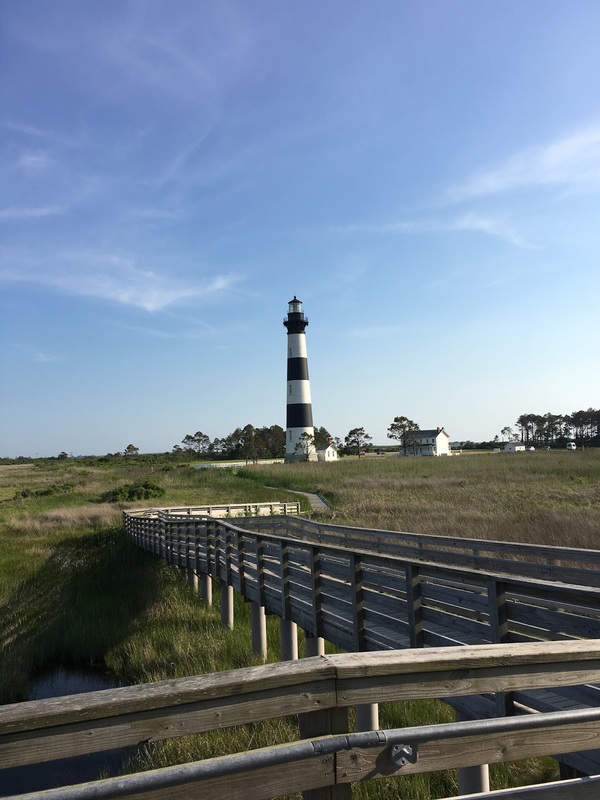 You've probably heard of these places: Nags Head, Kitty Hawk, Hatteras, and the setting for the Diane Lane/Richard Gere Nights in Rodanthe movie, based on the Nicholas Sparks book. 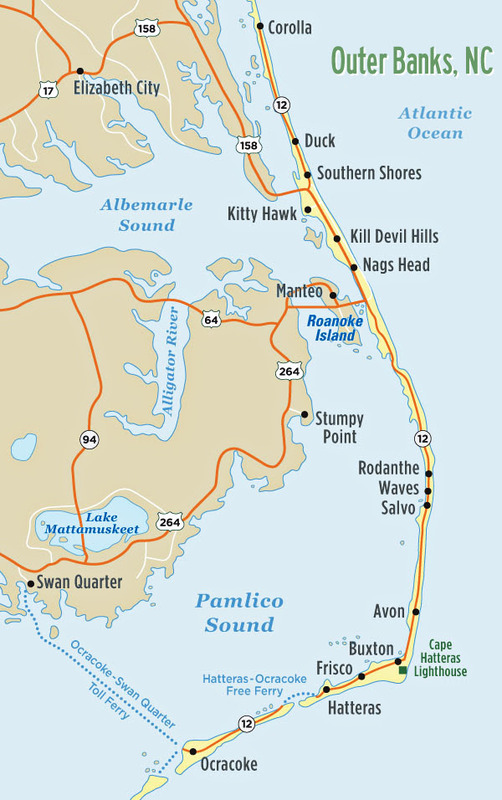 The Outer Banks (OBX) off the coast of North Carolina are barrier islands separating the Atlantic Ocean from the mainland, about a six hour drive from Charlotte. 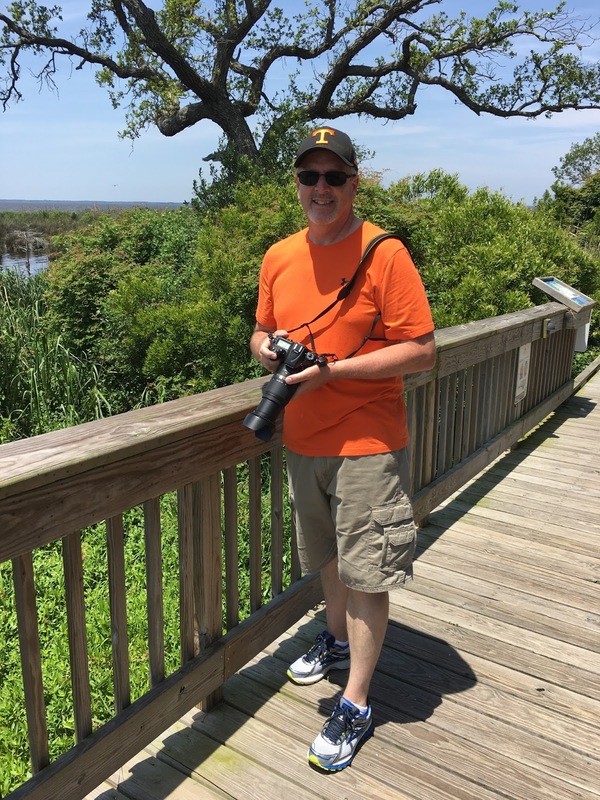 After years of vacationing at the more southern NC and SC beaches, Steve and I decided to visit there this past week. 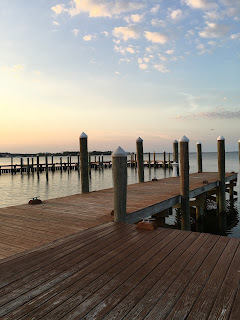 We stayed in Nags Head on Hwy 64, at the Oasis Suites Hotel, which we chose for its central location. On Monday evening we had a delicious dinner at the nearby Basnight's Lone Cedar Cafe, owned by former NC State Senator Marc Basnight, and operated by his two daughters. Everything on the menu is fresh, local, and just-picked. We were told that soft-shell crabs are in season, so we tried them as an appetizer and really enjoyed, along with our entrees of fresh flounder and the seafood combo. Tuesday morning we traveled south on Hwy 12, down that narrow strip of land that connects the islands and towns. 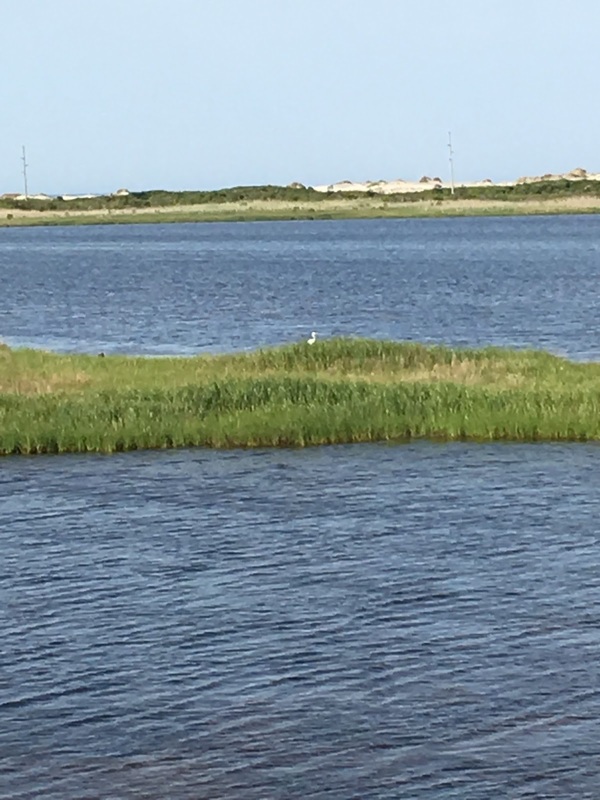 At some points, the land is so narrow that we could see the water right next to the road on both sides. 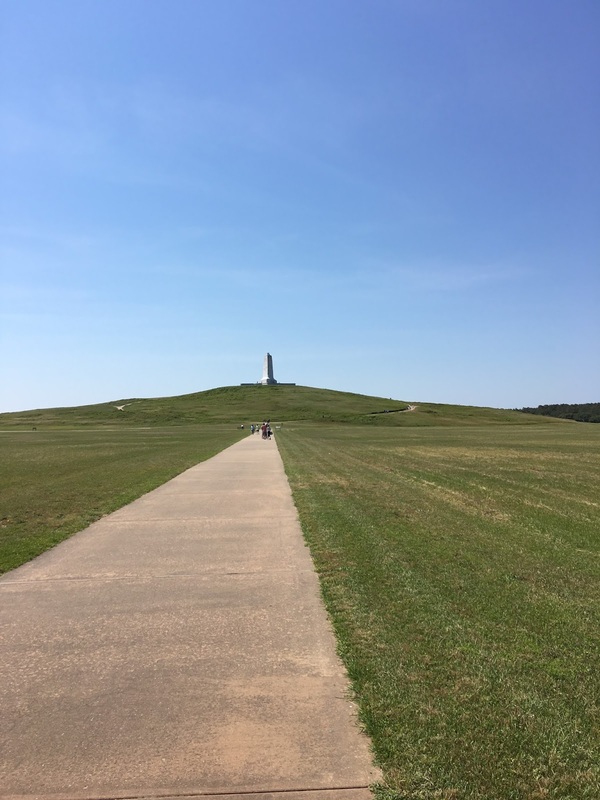 The week before Memorial Day turned out to be the perfect time to be there because tourist season had not really started so traffic was fairly light. 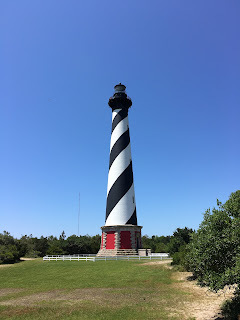 One of our first stops was at the Cape Hatteras Lighthouse. We didn't make the climb to the top, no regrets though. It is equivalent to a 12-story building, 257 steps to the top. I'm afraid of heights! I think I would have been okay as far as the trek up; there is a landing every 31 steps. Knitters are counters, so anything is achievable if you can stay on count, right?! Next we drove onto the ferry to take us to Ocracoke Island at the most southern end. 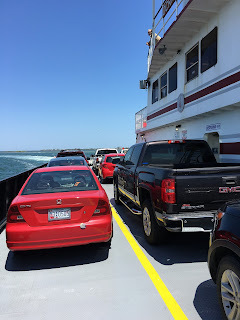 The ferry ride from Hatteras Island to Ocracoke took about 45 minutes. Being on a ferry with vehicles was new to both of us, and it was amazing. 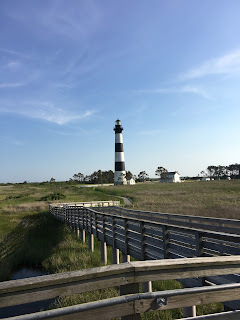 The village of Ocracoke was one of our most favorite spots. 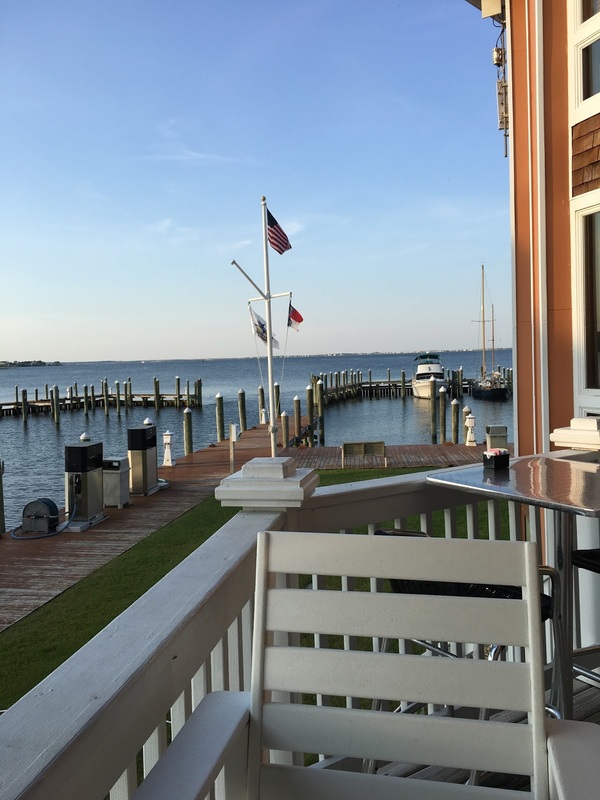 We had lunch at SmacNally's Waterfront Bar & Grill. Their hush puppies were the best I've ever tasted. Steve enjoyed a burger, and I had the buffalo shrimp special. Again, we walked right in, got the best table on the water, because the summer crowds had not arrived. And the weather was perfect! 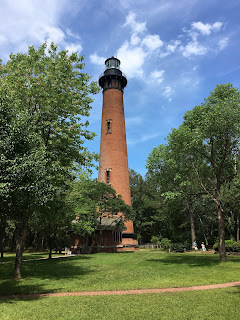 The Ocracoke Island Lighthouse was our next stop. It is tiny compared to the others, and visitors cannot go inside it. I'm glad we had the chance to see it. 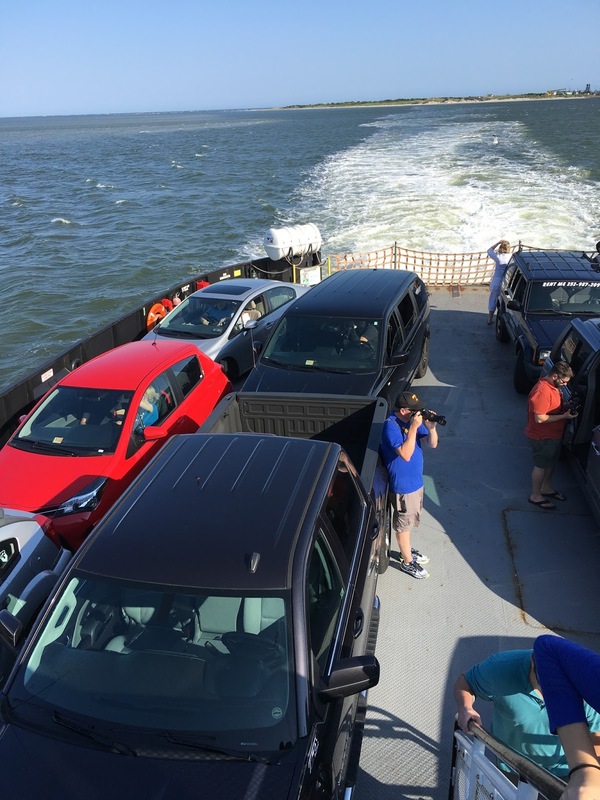 After the ride back on the ferry to Hatteras Island, we back-tracked to Avon. 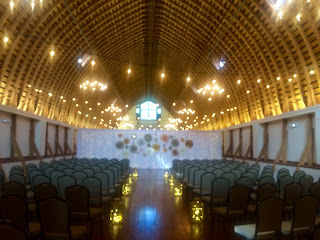 We were so excited because this was our ultimate destination to visit our family friends, newlyweds Alexa and Allen. And boy have they had an exciting year! 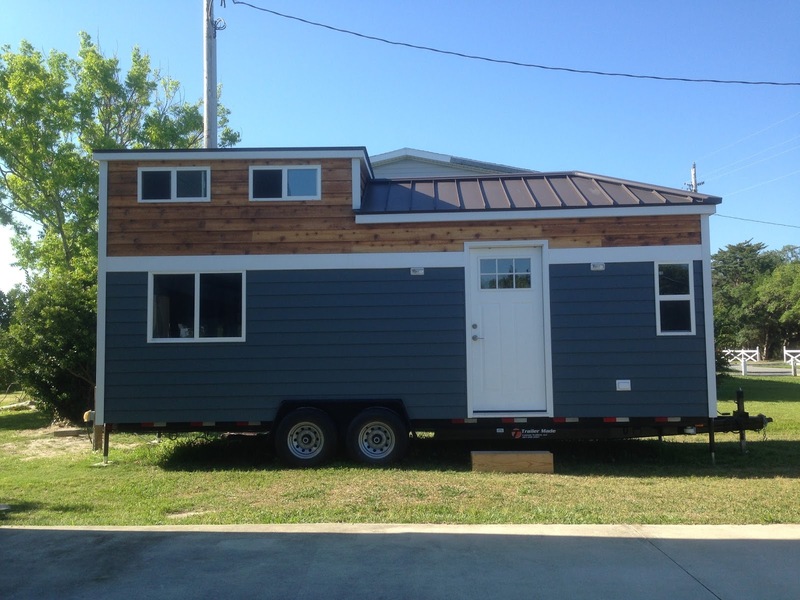 They moved to the OBX last fall, got settled, then were chosen to be on the FYI Channel's Tiny House Nation. They spent over a week in Chicago this spring with the cast and crew while their tiny house was completed, then drove it back to Avon behind their newly purchased truck. 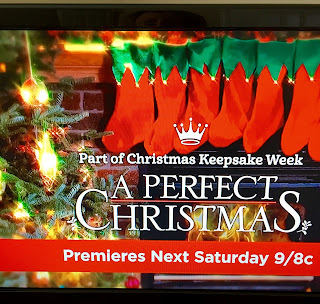 Their episode will appear late summer/early fall, and I'll be sure to post the air date. 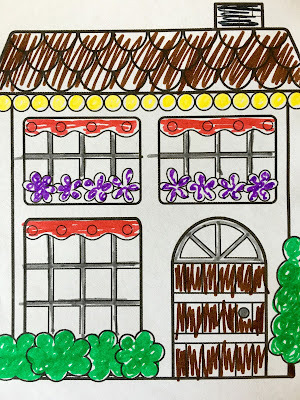 The home is cozy, homey, and they are so happy with it. It's the perfect complement to their Travel Well Magazine lifestyle. Alexa rode with us to meet Allen at the Avon restaurant where he works part-time, Pangea Tavern. It was by far the best meal of our trip, we both agreed on that. We started with the daily catch mahi fish bites, then for our entree we both had the special blackened mahi-mahi over rice and beans. Absolutely amazing! Thank you so much Alexa and Allen for the tour and wonderful dinner and visit! Driving back to our hotel later that night, we were about the only vehicle on the road. In spots it was very isolated and desolate, sort of reminded me of being on a rural Wyoming road. Wednesday was our day to travel north on Hwy 12. First stop was Duck Donuts! That was fun, they customize your donuts as you order. WooHoo, I just googled it and found there is a franchise in Charlotte, 14.9 miles from our house! 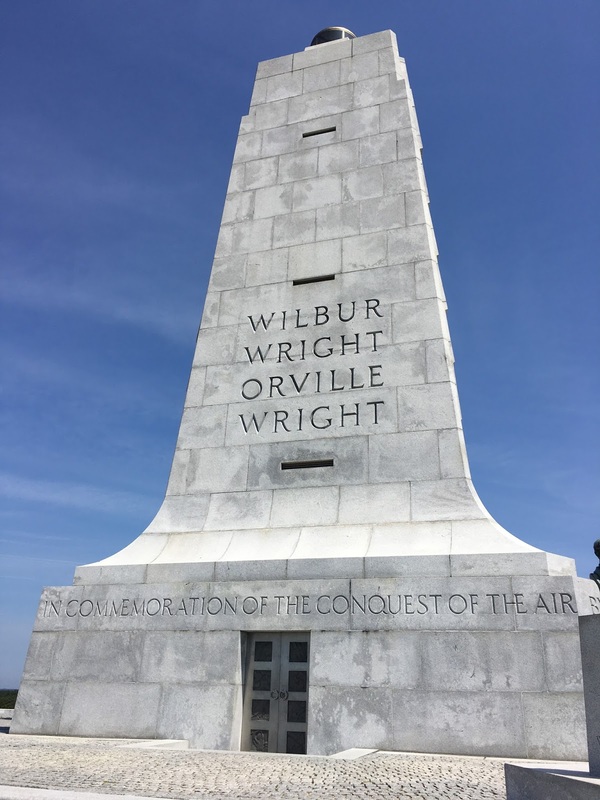 We needed the energy to hike up the hill at the Wright Brothers National Memorial in Kitty Hawk. 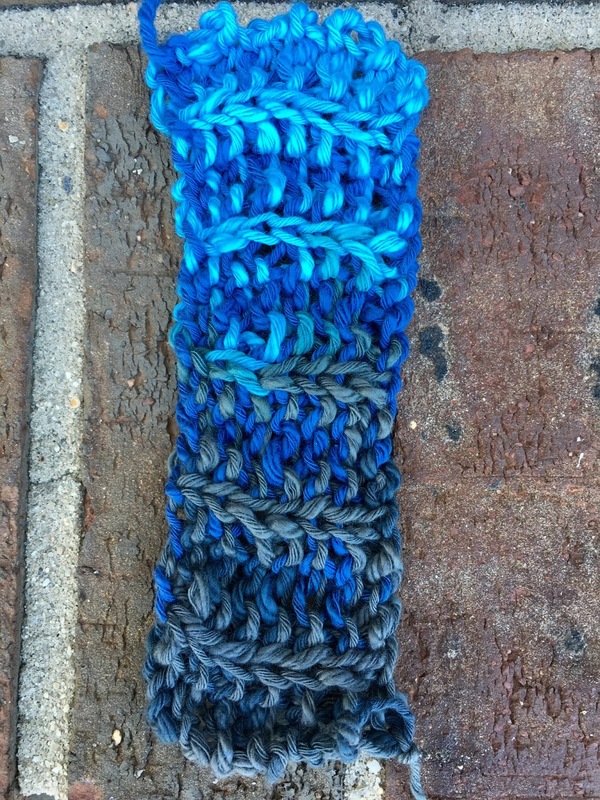 Next, my GPS navigated us me to a yarn store I had been told about (with a nice bench outside for Steve to wait). 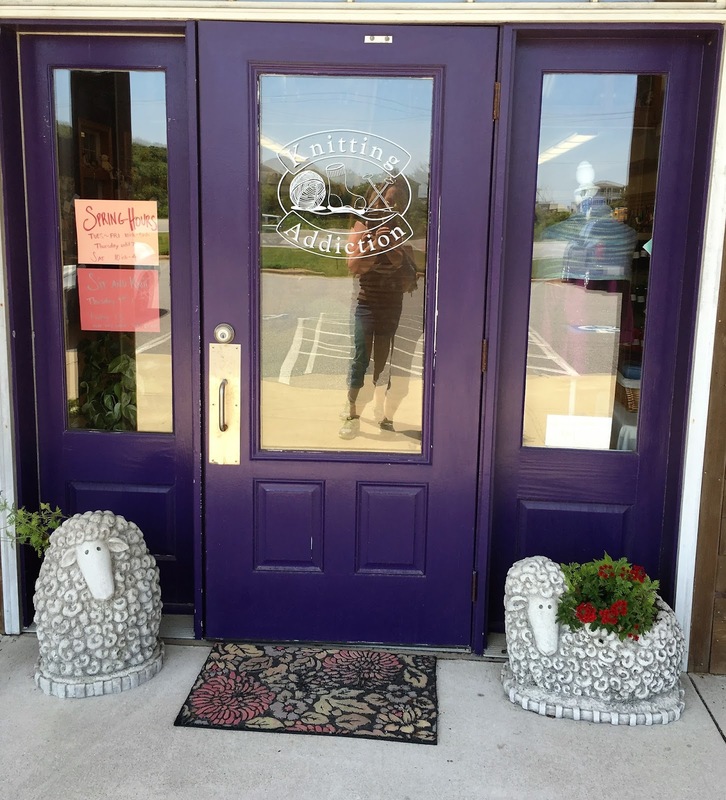 The Knitting Addiction in Kitty Hawk is probably the best LYS I have shopped in. It's spacious, modern, and stocked with all the most popular yarn and accessories that we see on Ravelry. There was a resident cat under the staircase and The Yarn Truck, a mobile LYS, parked in the back parking lot. 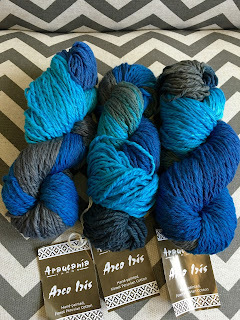 I was able to pick up a couple of skeins of souvenir yarn and breathe in some yarn fumes before continuing down the road. Next we drove to the Waterfront Shops in Duck. 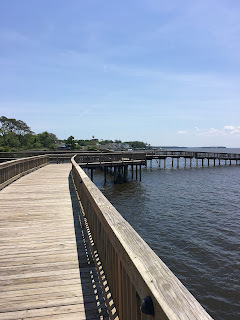 We walked along the boardwalk on the Sound, enjoying the views. Really a cool spot. Plenty of walking! Lots of shops and nature, all together in one location. There was the most wonderful independent bookstore called Duck's Cottage Coffee & Books with a great selection of beach reads and novels with stories taking place in the Outer Banks. The staff left little notes around the store on certain books with their comments, and that so appealed to me. Author Mary Kay Andrews was doing a book signing there today, wish I could have met her. We ate lunch at the outdoors counter at Coastal Cantina, featuring a Tex Mex menu (quesadillas and fish tacos) and a soundfront view. The Carrituck Beach Lighthouse is 10 stories and also open for a 220-step climb to the top (nope, we didn't attempt it). There was a lovely souvenir shop on the grounds too. Right down the road at the very north end of the island was the most amazing thing! The Corolla Wild Horses. We drove right onto the beach (a 4x4 is required). The horses seem pretty tame, yet many look rough. I have so many questions about what they eat, do they have shelter or vet care, etc.? Whew, the day is not over, we really jam packed in the sightseeing! 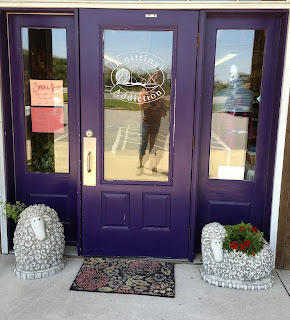 On the way back down Hwy 12 to Kitty Hawk, we stopped briefly into Trio, a wine-beer-cheese retail shop recommended by Allen, where we picked up some custom souvenirs. And Trio just happens to be next door to the Knitting Addiction LYS where we stopped earlier! We made a very brief stop at Jockey's Ridge State Park to see the giant sand dunes. By this point, we had walked a ton so we were not keen on hiking up a sand slope. 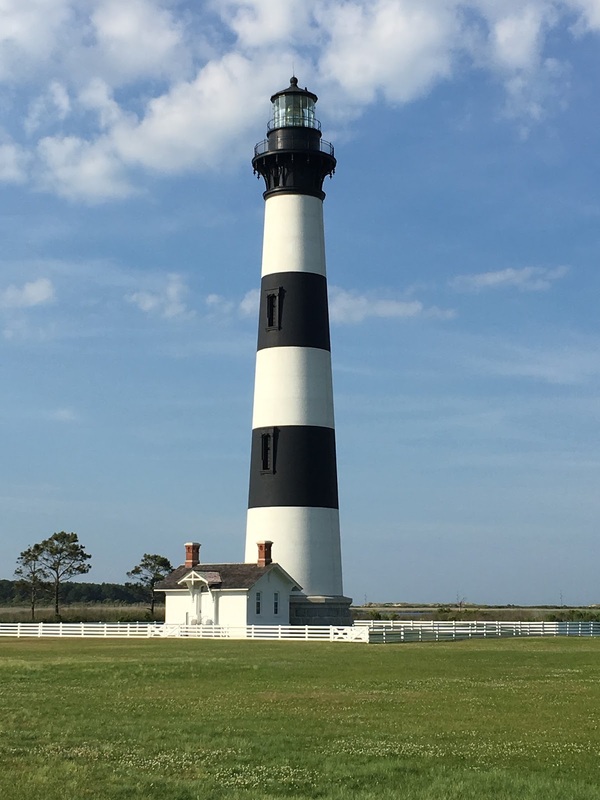 By far my most favorite . . .
. . . the Bodie Island Lighthouse. 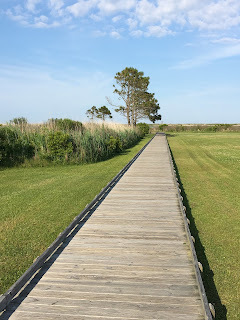 It had the most beautiful grounds of all, with a breathtaking boardwalk out to the marshlands. It was the most fun to photograph. 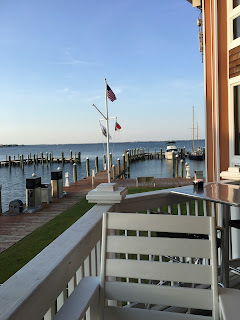 Finally, we headed straight to dinner, another al fresco meal, at Stripers Bar & Grille in Manteo, the kind of place where diners can drive up in their boats and dock by the restaurant. Steve tried a soft-shell crab sandwich, and I had their caprese salad and blackened scallops. If you're still reading this, I hope you aren't bored to tears. 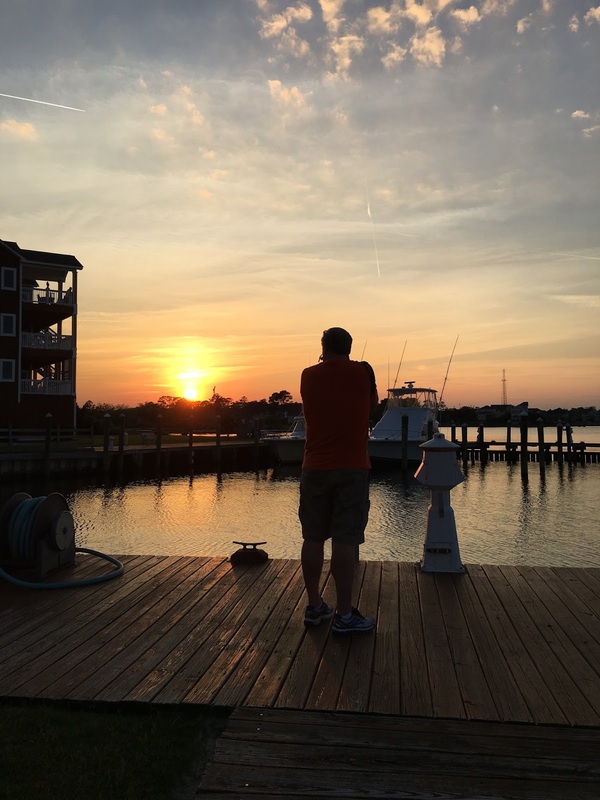 It was mostly to document memories for myself. We planned very little in advance for this trip. 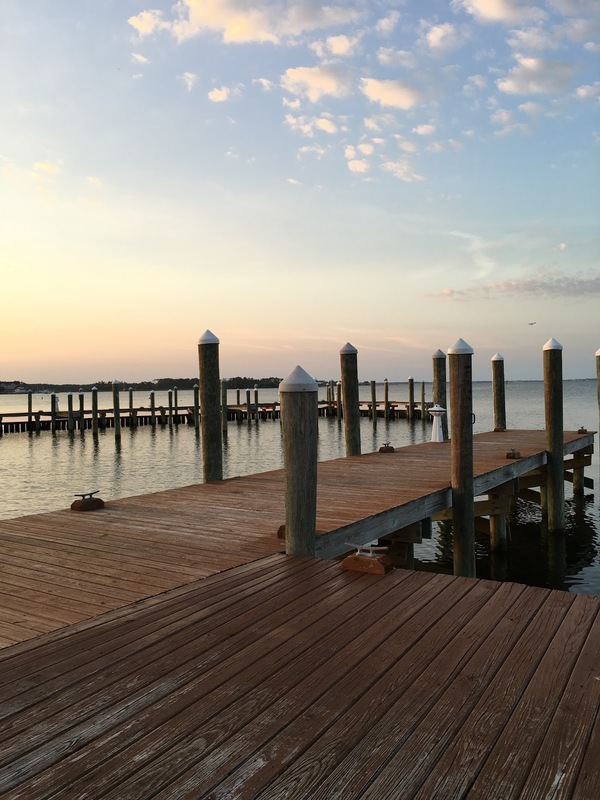 Other than a few restaurant suggestions, we figured out everything else on the go, and found the islands very easy to navigate. All of the lighthouses were free admission (it costs a small amount if you want to climb to the top), the ferry and driving on the beach were free, and about the only site we had to pay admission to was the Wright Brothers Museum. Before this vacation, I had never really thought much about lighthouses, but now that I've seen these four distinct ones, I am absolutely in love with them. The National Park Service and State of North Carolina have done a really nice job, and I hope you'll have a chance to visit here someday!